Knights of the Rioga are of the highest honor and distinction. In the land of Mobrin, there are many orders of Knights, and many hedge Knights, but to become a Knight of the Rioga, one must truly be special. The Rioga serve the King and are duty bound to protect the royal family and their interests. Only the toughest, highest trained men in the land would be brought into this order. Rioga are more often of noble blood than any other knightly class as they have received the best possible gear and training. There are nonetheless a good number of non-noble Rioga who have excelled in battle and gained the King's favour. 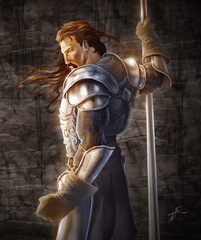 They are usually set apart from other knights by their smokey dark or black armor and golden spurs where as most other knights wear silver spurs. There are exceptions but the blackened armour and gold spurs are something of a trademark of the King's Rioga. Knights of the Rose are another famous order of Knights. These men have served the Duke of Weston since the fall of the empire. They are knighted by the Duke, who must also be a knight to do so, or by one of his knights and serve at his leisure. 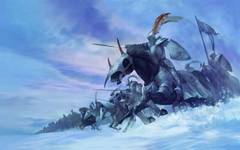 In every Great War, they have been sent to fight for the King of Mobrin. The King has never offered a position in the Rioga to a member of the Rose, out of respect for the Duke. Knights of the Rose are usually not noble, but nobles of Weston may become knights of the Rose. Obviously a noble of another house may have a conflict of interest in serving Weston instead of their own House. Knights of the horse hail from Sutherland, and are knighted by the Duke of Sutherland, if he is also a knight. This order of knights have served for 1,200 years, and were originally created by the Emperor to defend the south, and maintain order and structure in the Barony of Sutherland. When the empire collapsed, the Grand Master of the Knights of the Horse swore his loyalty to the Baron of Sutherland. Today, this order serves the Duke of Sutherland. These knights again are their own social class and are usually not noble. 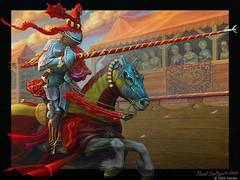 But nobles of House Crawford or of their noble vassal houses may become knights of the Horse. Most noble houses retain knights, though equipping knights and retaining them is /extremely/ costly. Some knights come of knightly houses or may be of nobility themselves and thereby can afford their own war horses, weapons, armour and servants. Knighthood is considered a social class all of it's own, neither commoner or noble as a rule, but of the highest military tradition. As they fight with weapons close up and imperil their bodies to do so, rather than using bows and less honorably killing men from afar, knighthood has the highest regard among fighting men. That is what draws even nobility to join the knightly ranks. Commoners /can/ become knights but it is extremely difficult (see below). They can not afford to pay for their children to be squired, nor to equip them with a trained war horse that costs a fortune in gold, nor weapons and armour that are easily as costly as some manor houses. They then will be considered poor hedge knights and of the lowest possible ranks among knighthood. They must seek to impress wealthy sponsors to attain horses and arms or to win them at tournament. Such can easily be lost and render even a noble knight suddenly poor should he loose his fortune in arms and horse. Often these are ransomed back at a fraction of their value but the ransom is up to the winner to decide and he may decide to keep the horse and armour if he needs them, or didn't care for the knight he vanquished. There were only a few ways in which a person could become a knight. The first way was the normal course of action for the son of a noble or the son of a knightly House (non-noble). Women can never be knighted. When a boy was eight or nine years old, he was sent to the neighboring castle where he was trained as a page. The boy was usually the son of a knight or of a member of the aristocracy. He spent most of his time strengthening his body, wrestling and riding horses. He also learned how to fight with a spear and a sword. He practiced against a wooden dummie called a quintain. It was essentially a heavy sack or dummie in the form of a human. It was hung on a wooden pole along with a shield. The young page had to hit the shield in its center. When hit, the whole structure would spin around and around. The page had to maneuver away quickly without getting hit. The young man was also taught more civilized topics. He would be taught to read and write by a schoolmaster or tutor. The lady of the castle taught the page to sing and dance and how to behave in court. At the age of twelve or thirteen, a boy became a squire in service to a knight. His duties included dressing the knight in the morning, serving all of the knight’s meals, caring for the knight’s horse, and cleaning the knight’s armor and weapons. He followed the knight to tournaments and assisted his lord on the battlefield. A squire also prepared himself by learning how to handle a sword and lance while wearing heavy armor and riding a horse. When he was about twenty, a squire could become a knight after proving himself worthy, usually after a battle. A lord would agree to knight him in a dubbing ceremony. The night before the ceremony, the squire would dress in a white tunic. He would then fast and pray all night for the purification of his soul. The Priest would bless the future knight's sword and then lay it on the Sess's altar. Before dawn, he took a bath to show that he was pure, and he dressed in his best clothes. When dawn came, the priest would hear the young man's confession. The squire would then eat breakfast. Soon the dubbing ceremony began. The outdoor ceremony took place in front of family, friends, and nobility. The squire knelt in front of his knight, or his lord if he is also a knight, who tapped the squire lightly on each shoulder with his sword and proclaimed him a knight, with or without the coulee. After the dubbing, a great feast followed with music and dancing. It should be noted that while any noble in the old days could make a new noble or a knight, now that noble houses and knighthood are well established, things are more strictly structured. Only knights or the King may make other knights - even so, there are rare exceptions where a higher ranked noble, a Duke or Count, may have need to knight men in the field. These can later be further legitimized by other knights or the King acknowledging them within their order. But if these knights then do not conduct themselves in appropriate knightly manner it will reflect /very/ poorly on the lord who so raised them. Such a lord may be stripped of his titles by the King if it goes ill. Generally any means of knighting a man other than him earning his way through squiring, is frowned upon by other knights. For commoners, the road to knighthood is not simple. It is incredibly difficult for a commoner lad to be accepted as a page/squire by anyone other than a hedge knight (ie - a knight who was once a commoner as well.) It's also expensive and commoners usually can't afford to send a son this route. While it CAN happen, it is usual that these knights are named before or after a large battle, and even that is rare. Getting equipment can be even more difficult for it costs a fortune. But if an under equipped man is able to do great and unusual deeds well above and beyond the usual expected of a soldier in battle, he may be deemed worthy to be knighted as reward for serving his lords. The very term 'hedge knight' is a derogatory term and thus are much less desirable to a lord to retain because they are not educated as squires. It should be noted that a noble should /only/ squire to a noble knight who's noble rank is the same or higher, lest that knight be of exceptional renown. It is not unusual for the wealthier knights of highest renown or rank to have more than one squire at a time, but three is usually the limit. It is far more normal to only have one or two squires at a time. Knights believed in the code of chivalry. They promised to defend their own, be courteous to women, be loyal to their king, and serve Sess at all times. Knights were expected to be humble before others, especially their superiors. They were also expected to not boast too much. The code of chivalry demanded that a knight give mercy to a vanquished enemy if asked and instead ransom them. However, the very fact that knights were trained as men of /war/ belied this code and sometimes being men of war out weighs being entirely chivalrous. This is not the high age of flowery words and the highest, later forms of chivalrous knighthood. A knight was armed and armored to the teeth. He had so much armor and weapons that he depended on his squire to keep his armor and weapons clean and in good working condition. Armour is also very heavy. A set of chain mail may weigh 50 lbs and a set of partial plate with chain is more. A set of full steel plate of the weight that steel had to be before modern steel refinements, may easily weight twice as much as a set of chain mail. Add on a shield and lance and you need to be a powerful man to control your arms for hours of combat on foot or horse. At first the armor was made of small metal rings called chain mail. A knight wore a linen shirt and a pair of pants as well as heavy woolen pads underneath the metal-ringed tunic called a gambeson. A suit of chain mail could have more than 200,000 rings. As time passed, knights covered their bodies with plates of metal with or without chain mail. Plates covered their chests, back, arms, and legs. A helm protected the knight’s head and may have a hinged metal visor to cover his face. Suits of tournament armor could so heavy to wear that a man required the assistance of more than one other man to mount his horse when in full plate. Some knights also needed a shield to hold in front of himself during battle. Shields were made of either wood or metal. Knights decorated their shields with their family emblem or crest and the family motto. A knight''s weapon was his sword. It was worn on his left side in a scabbard fastened to his hip. A knife was worn on the knight’s right side. Knights used other weapons in combat as well. A lance was a long spear used in jousts. Metal axes, battle hammers, and maces were also used to defeat the enemy. Tournaments provided a means for knights to practice warfare and build their strength in times of peace. Tournaments were essentially mock battles with audiences. The tournaments had different rules that had to be followed. They were judged by Marshals that watched for dishonest play. Tournaments were usually fought between either two people or two teams. If two people fought a tournament, it was usually by jousting or tilting. The two knights would gallop across the playing field at each other. They carried long, blunt poles and shields. The objective was to knock the other person out of his saddle or score points by striking shield or helm. Team play was conducted with fierce mock combat between two bands of fighters. They fought with wooden or blunted weapons so as to reduce the risk of getting hurt. However, this was often not the case. Many people did get hurt or die by accident. For an outline of Tournament events and rules, see the Tournament page. 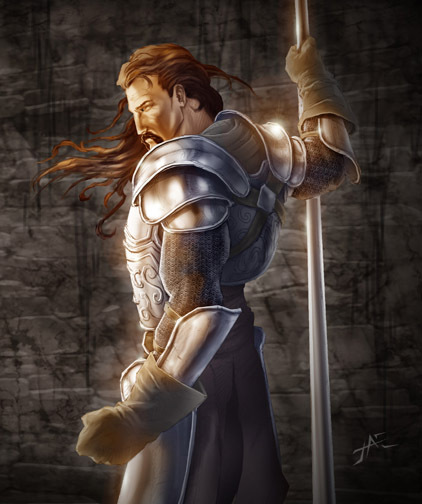 In addition to Knights, Daeren has Men at Arms, Guardsmen, and Mercenaries, all of which would learn to fight somewhat differently than Knights. In some noble households, the knights might well train along with the Men at Arms and Guardsmen. Men at Arms: Armoured soldiers, usually cavalry, who could also fight on foot. They are not knighted and generally commoners. Guardsmen: Commoners who have a role in a City/Town/Castle Guard (policemen). Mercenaries: Mercenaries are hired blades, those who fight for money. Mercenary companies are known especially with all the wars that have been going on. These companies may accept men and women recruits, at the discretion of their Captain. Note - women fighters are rare, and PC women who fight should expect that they may well be looked down upon by other PCs. Additionally, most PCs of any sort will look down on Mercenaries.